The two rivals are coming together to spread the word about the importance and value of a higher education. 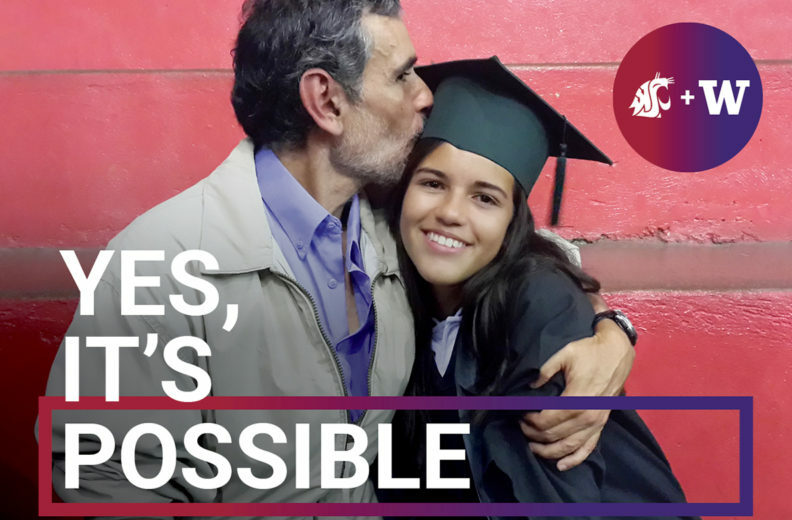 The “Yes, It’s Possible,” campaign debuts Monday — kicking off Apple Cup week — with a string of joint activities designed to raise awareness of the access to higher education in the state. Scheduled to continue through spring, the effort features a digital marketing campaign and other targeted advertising aimed at potential college students. Higher education is the surest path to mobility, opportunity and a better life, university officials said. Regardless of background, interest or hometown, there’s a clear path to a quality higher education in Washington. Higher education pays dividends by providing access to healthier, more rewarding lives, as well as increased participation in communities and a chance to provide for families. Statistics show student loan debts in the state of Washington are not as large as many might think. Nearly half (48 percent) of the Class of 2017 that graduated from a Washington baccalaureate-granting institution left with no student loan debt, and Washington ranks second in the nation in need-based grant aid per undergrad student (behind New Jersey by $6 per student). Of those who did graduate with debt across the state, it was less than $24,000, on average, and the three‑year student-loan default rate for graduates from Washington’s four‑year universities is 4.7 percent, compared to the national average of 11.5 percent.